The other day at Mochi Sale at Kapaa Jodo Mission, I happened to hear conversations between ladies from Japan. One lady was complaining that people here start serving rice from rice cooker without turning over cooked rice. She continued to say, "Rice could have been much better with a little more action but they seldom do the action called "hogushi" Then another lady agreed and said, "My children, too, never do "hogushi" though I told them so many times." I quite agreed with them and I thought it was very important to introduce the meaning of "hogushi" which literally means "to loosen." The reason why we need to turn over/flip/stir/mix the cooked rice as soon as rice was cooked, was because cooked rice contained extra water and the percentage of containing water was not even. 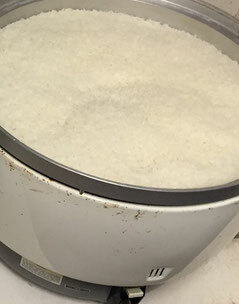 At the very bottom of the cooker, rice contains more water. On the other hand, around the surface, rice becomes more dry. You should see all the steam coming up as soon as opening the rice cooker. This happens because water from rice steams away rapidly. 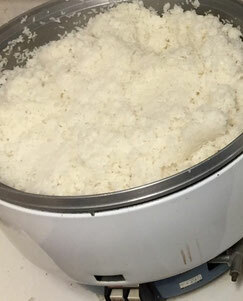 The more steam, the more dry the rice become, while rice at the very bottom still contains too much water. That is why we need "hogushi." By turning over/ flipping/ stirring/ mixing cooked rice, we can adjust the percentage of water inside rice, and it should be not too soft nor not too hard after hogushi. The difference can be huge depending on the size of rice cooker. 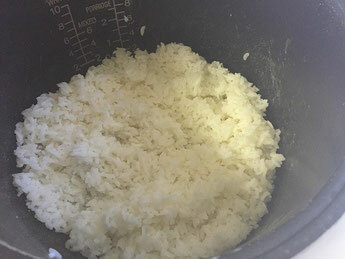 So if you don't do "hogushi" with a huge rice cooker, then rice at the surface of the cooker should be very hard and rice at the bottom should be very soft. We just returned from Okinawa. At the wonderful hotel breakfast buffets I noticed the gohan in the cookers had been kind of fluffed and turned. Made for very enjoyable eating! We made a note to start doing that at home and now today thanks to you and the ladies, we know it's called hogushi. Welcome back to Kauai, Stephanie-san! And thank you very much for your comments. "Hogushi" is noun and "Hogusu" is verb. It is hard to translate "Hogushi" into English. But I thought fluff may be a good translation after looking at your comments. Arigato gozaimasu. By the way, some Japanese might call it "Kaki-Mazeru (to mix)"